For some time now (about two months) I have been overwhelmed by the number of activities I had in my life. I was struggling to keep up and my level of productivity was gradually deteriorating. I could see problems coming up in every aspect of my life (Work, Personal, Family, Community – the four aspects of human life) which I faced great difficulty in resolving for good. There was a turning point in this downfall. I have failed one commitment I had against a friend. We were supposed to start a project together but I have failed to stay up to the task. It felt horrible and something had to be done about this. 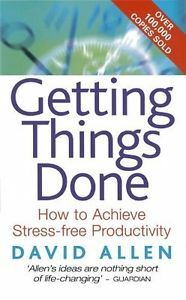 A little while ago my manager told me about this book “Getting things done” by David Allen. It supposed to have the mystery key of productivity for people who are continuously very busy. So, I decided to give it a go. I ordered it from Amazon, for about 12 pounds if I can remember correctly, and started reading it on the way to work and back. Within the first chapter I could easily see myself in the descriptions about the individuals he trained. He was describing various work / home / family situations that I have experienced during the past two months which were very unpleasant. At some point during the first few chapters, you get the general idea of the “Getting Things Done” methodology. What you don’t expect however is the practical step-by-step guide that follows. It seems like David Allen himself is sitting next to you and training you on his methodology. Although you might find that he is referring a lot to various types of executives, I believe that I could easily map his ideas to my context. There are two keys for success in my opinion. Mapping the methodology to your context is the first, because if you go into the practical step by step guide, you need to map it to your life for it to function properly. The second key is to constantly have an empty head. That’s the only way to tackle with all activities coming your way. So, without any further delay, here is a description of my context and my personal experience of following the methodology of “Getting things done”. I work as a software engineer. I also play the keyboards and I want to start my own business. There is also family, friends, hobbies and other personal activities which all deserve to be treated equally in order to achieve a balanced life. 1. Collect – This is the point where you have to empty your head and all your space around you. For a software engineer these days, that means not only to clean your work and home desk as well as the entire physical world you live in. It wasn’t just about physical gather and mental gather, but also digital gather. For me personally, it meant to gather all paper around my desks and piano and put it in my in-basket. It also meant to clean all my devices and put all the stuff in the digital in-basket. I gathered all the files in my hard drives, all my bookmarks and all my email into one location. That part took a while! 3 smartphones, 2 laptops, 1 desktop. Digital files pretty much everywhere! And then comes the empty-your-head part. Its harder than you think. I used post-it notes as recommended in the book and the list of memory triggers. They turned out to be pretty handy. I also had to write down all my musical ideas. Picture below illustrates my physical in-basket after I finished this step. 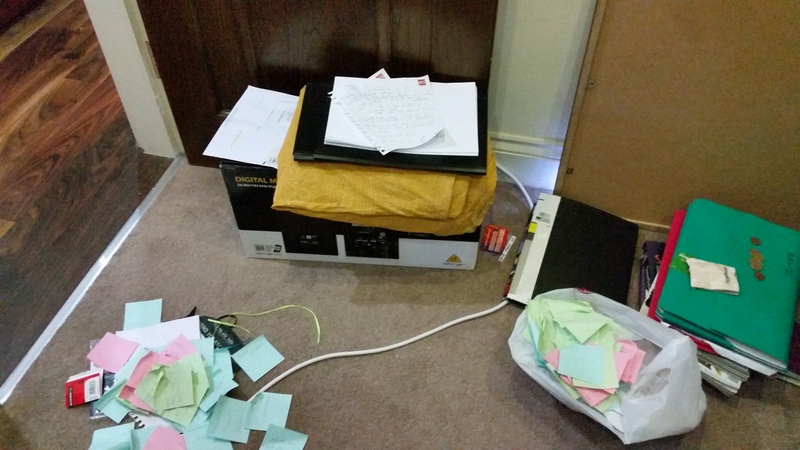 A plastic bag full of post-it notes and other loose paper, some of the post its on the floor and few large items around the plastic bag. 3. Organise – This is the part where you determine your lists and file system. My lists are as follows: Active projects, Agendas, Next actions, Sometime/Maybe, Waiting for . Email software has suffered major lifting too. Anything staying in the inbox is because there’s an action on me, i.e. next actions list. Email that needs to be kept goes into the active projects folder, or into the general reference material. Lists are not prioritised they are there for understanding what you have to do at a given point in time. I have also redefined the usage of my calendar. It now only holds time specific actions (meetings etc) or day specific actions. 4. Review – My daily review takes 2 minutes. I look at my calendar and get an idea of what time intervals I have at my disposal. I then review my next action lists and agendas (people to speak to). The weekly review requires a little more. Requires doing it all from scratch but the volume is much less hence it takes a lot less time. 2-3 hours every Friday afternoon. 5. Do – This is the big question for everyone. What do you do on Wednesday 10am? There are four criteria that helps decide. The current context, the time and energy available and finally priority. Some people do predefined work or do work as it comes in. It helps however to have an understanding of where you are and also welcome interruptions to your work for all less-than-two-minute actions. The key question to ask here is: “Why am I doing this?”. This will help you identify and review your work and also map it to what is important in life for you personally. To sum up, I will not say that this model has proven to be amazing. I am not claiming that my productivity rapidly increased. But its a huge step forward because it feels I’m in control again. It introduced two concepts that I wasn’t following before and that proved to be amazing: Next actions by context and daily/weekly review of everything. This is really worth the weekend I spent following this method and I sincerely hope you enjoy the process. Have fun! This entry was posted in Interesting and tagged Activities, banking sector, busy, collect, commitment, context, do, empty-head, Getting Things Done, in-basket, laptop, lists, methodology, organise, problems, process, Productivity, projects, review, software. Bookmark the permalink.